Eric Clapton’s Motor Yacht – Superyachts News, Luxury Yachts, Charter & Yachts for Sale. In his autobiography, legendry rock star Eric Clapton tells us that he loves the ocean and yachts. In fact Eric Clapton owns his own luxury motor yacht called VA BENNE according to a report by the luxury yachting magazine Super Yacht World. Eric Clapton also enjoys nothing more than sitting in a deck chair on a white sandy beach watching his children playing in the ocean. Image: Eric Clapton spends time relaxing on his impressive superyacht Va Bene. Eric Clapton chartered motor yacht Va Bene in 2005 and cruised with friends around the Mediterranean. It’s the perfect antidote to a punishing music concert tour schedule and he found that he was particularly at ease aboard the 157 ft (47.8m) motor yacht. Among Eric’s favourite places were the sheltered port of Bonifacio at the southern end of Corsica. Mr. Clapton actually enjoyed Va Bene so much that he bought the luxury yacht. She is a steel hulled displacement yacht with a cruising speed of about 14 knots. 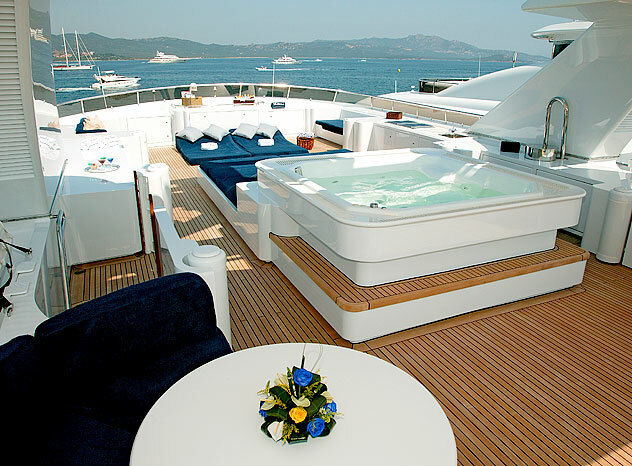 Va Bene can accommodate 12 guests in six separate sleeping cabins and has a crew complement of 13 when under charter. M/Y Va Bene had originally been commissioned by a Greek ship owner in 1992 to a design by Richard Hein (of Oceanco) and built by Kees Cornelissen in Holland. Luxury yacht Va Bene was then purchased by F1 motor racing supremo Bernie Ecclestone. Having lived with Va Bene as it was after the purchase for a couple of years, Eric Clapton finally felt the time was right for a refit. Clapton was particularly keen for the work to be carried out in the UK and Pendennis Shipyard in Falmouth, Cornwall, was his choice of shipyards. Indeed another famous rock musician, Roger Taylor, the drummer with Queen has his yacht Tiger Lilly refitted regularly in Falmouth as well as Pete Townsend of the WHO, who is another famous client of the yard. Eric Clapton has a house on the island of Antigua and Va Bene is based there in the Craibbean during the winter season. The first thing that strikes you on boarding Va Bene is the calm, informal atmosphere of what is clearly a much loved family yacht rather than a show off yacht. Eric Clapton known as an unpretentious family man who wants a yacht that he can relax on – despite being one of the world’s greatest living rock stars. Motor yacht Va Bene’s saloon is divided into four separate areas with clusters of contrasting chairs, sofas, tables and cabinets, One group of guests can be relaxing round the card table and matching leather chairs, while others can stretch their legs on the big taupe corduroy sofa to watch a movie. The adjacent dining room is a little more formal but is still a wonderfully light room centered around a huge limed oak table inlaid with Italian marble. Eric Clapton is a keen collector of modern art and every spare wall and surface on the luxury yacht reflects this passion. From large, sprawling canvases and some beautiful marble sculptures and ceramic vases, to intricate postcard sized oil paintings of Venice it is a collection that reflects the rock musician’s ability to transcend the confines of any one genre. The yacht also displays neutral tones in the décor and there is an Art Deco theme running through the main guest areas, which the refit has refreshed and modernized rather dispensed with. The musician’s yacht gives very cabin and guest space with a discreet Arcam iPod dock so that guests can plug their his iPhone wherever he is and enjoy instant access to his personal music library. All bar one of the existing Bang & Olufsen CRT televisions have also been swapped for high-definition Panasonic Viera flat screens. The highlight of the refit is the new owner’s suite on the main deck. This is a space that Clapton and his wife rarely used before the refit, but it’s a much more enticing space these days. It now enjoys a much bigger family bathroom complete with walk in rain shower, dramatic stone basins, a large tub and a natural teak floor – as designed by interior designers H2 in Putney, London. Va Bene is available for charter through Burgess Yachts in the Mediterranean and Caribbean. It’s not often you get to walk in the shadow of a genuine rock legend but on Va Bene you can also swim, sunbathe and sleep in Eric Clapton’s personal holiday home and luxury yacht charter vacations just doesn’t get any better than that. Luxury Motor Yacht VA BENE is a wonderful superyacht which is availalble for yacht charters in the MEditerranean and Caribbean oceans. Charter ates may change over time. Contact your preferred independent yacht charter broker for further details on VA BENE.